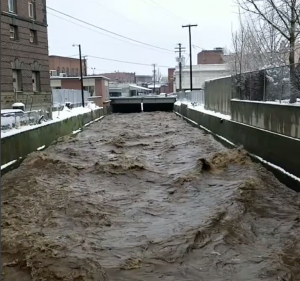 The Mill Creek Channel in downtown Walla Walla during flood stage in December 2017. MYCB file photo, courtesy of Cole Massey. UPDATE: The February 11, 2019 Council Work Session was canceled due to inclement weather. The meeting has been rescheduled for ld on Thursday, February 21, 2019. Note the location is at Fire Station 1 at 12th and Poplar Streets, 4:00 p.m.
WALLA WALLA, Washington – A representative from the U.S. Army Corps of Engineers will answer questions from city council members this afternoon regarding the three-year analysis of the Mill Creek Channel that runs through the heart of the city. It’s all part of a city council work session which will be held at 4 p.m. at the Walla Walla Police Department’s Fulton Community Room at 54 E. Moore St. The work session is not being held at Walla Walla City Hall as that location is currently undergoing renovations and safety upgrades. The U.S. Army Corps of Engineers is partnering with Walla Walla County, the city of Walla Walla, and the Port of Walla Walla, as well as other agencies to conduct a general investigative study of the overall condition of the channel and any improvements or changes that can be made. Mayor Barbara Clark said she believes the Corps may have four or five options regarding the future of the Mill Creek flood risk management system. The goal of Monday’s question and answer system is to understand fully the scope of the study and see what the preferred option might be. Clark said she would like to see Mill Creek look more like a river and hopes everyone can work together to naturalize parts of it. A flood in 1996 caused significant damage to the Mill Creek levee system, flooding upstream and downstream and damaging and nearly overlapping parts of the concrete channel. Some of the components of the system have degraded, resulting in decreased capacity and reliability, the Corps states in a fact sheet about the Mill Creek General Investigation Study. The Mill Creek GIS will consider the reduced capacity, performance and reliability of several components of the existing system. It also will develop a range of alternatives that could be implemented to reduce those risks.